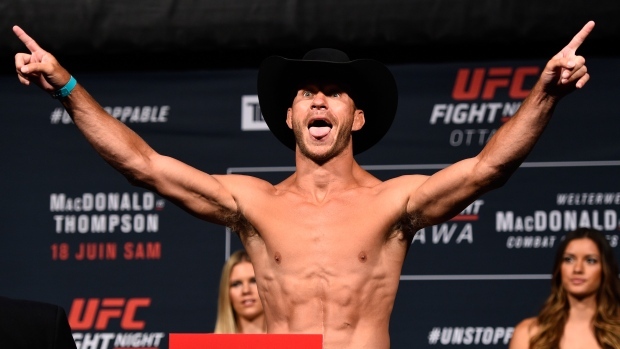 UFC senior vice-president of international and content David Shaw confirmed the initial report from ESPN’s Ariel Helwani that fourth-ranked lightweight Al Iaquinta will be facing ninth-ranked Donald “Cowboy” Cerrone in the headlining bout at the Canadian Tire Centre. Cerrone had recently been linked to former featherweight and lightweight champion Conor McGregor, but that bout fell apart when it was being targeted as a co-main event, which was a deal-breaker for McGregor according to reports. Last April, Iaquinta fell short when he fought Khabib Nurmagomedov for the vacant lightweight championship (had Iaquinta won, it would have remained vacant as Iaquinta weighed in at 156 pounds for his initial matchup with Paul Felder) at UFC 233 in Brooklyn. Seven Canadians are currently scheduled to fight on the card. “We are really excited to see Marc-Andre Barriault compete. Obviously Brad Katona and what he’s done with [The Ultimate Fighter] and his first performances in the UFC have been great. It’s nice to see Mitch Gagnon get back. There are a whole variety of Canadian athletes that we’re going to be very excited to showcase,” said Shaw. Shaw also confirmed that there would be a pay-per-view event held in Canada later this year. Based on the annual staples of the UFC’s pay-per-view calendar, it is likely that the event takes place in August or September. Tickets for UFC Fight Night in Ottawa are available to the general public starting on Friday.